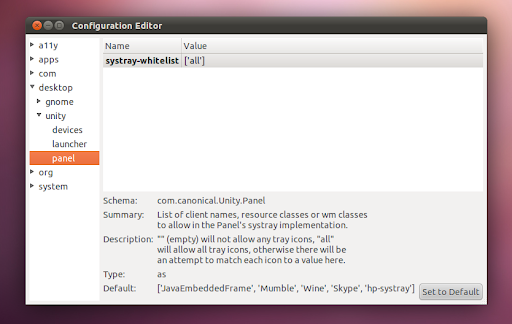 Unity got its notification area (called Systray by the Ubuntu developers) back a while ago, but only for a few applications: Java apps, Mumble, Wine applications, Skype, and hp-systray. But there's an easy way to either re-enable the Systray for all applications or to whitelist a few applications you can't live without. Read on to learn how to get your systray back! A. Using the command line. The above command includes the already whitelisted (by default) applications so you should replace "YOUR_APPLICATION" with the application you want to whitelist. There is also a script created by Fewt to easily whitelist an application for using the Systray. You can get the script from HERE. Or, if you want to whitelist only a few applications, add them to the end of the already existing list. 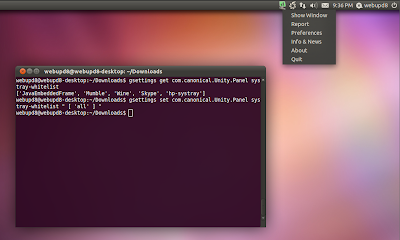 Or click the "Set to default" button in the "dconf-editor".